Description: Bauer Pig Pin - Ain't this porker a corker!! 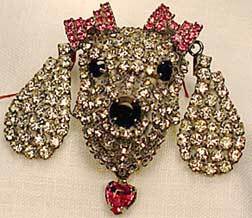 This 3-dimensional pin is done with blush pink rhinestones, accented with rose pink ears, snout and feet, and a single black rhinestone eye. 2 1/2" x 1 1/4" x 3/8" deep. I'm getting one to wear for the county fair - believe me, this ones a LOT cuter than the real thing, and smells better and eats less, too. 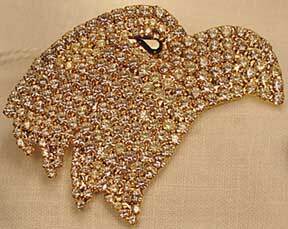 Description: Bauer Eagle Pin - When everyone else has the same traditional designs, you can count on Dorothy to come up with new ideas sure to become classic! 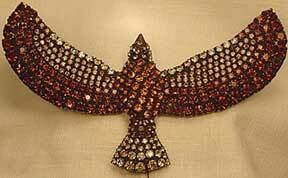 This wonderful eagle is done in antiqued brass with smoky and Madeira topaz rhinestone wings and body, and jonquil rhinestone head and tail. This piece measures 3.75 inches by about 2". This coloration would be excellent with any fall colors.